Kelley runs a 3:04 in the Tokyo Marathon 2015! Kelley ran a PR of 3:04 in the Tokyo Marathon! Jordan wins an oversized check! Jordan wins the Henderson Classic/Desert Dash 55K! Jordan wins the Eagle Island 48-hour Race! Jordan placed 2nd overall (1st female) in the Eagle Island 2-day race, completing 175 miles in 48 hours! Victoria Petryshyn, 4th female overall! Nicole Drummer placed 13th in her division in the Boulder Sprint Triathlon on June 16, 2013! Kate Kostal, who placed 2nd in her age group in the Universal Sole 4 mile Classic, is currently training for her first Ironman -- Ironman Louisville on August 25th. Let's wish her the best of luck in her training! 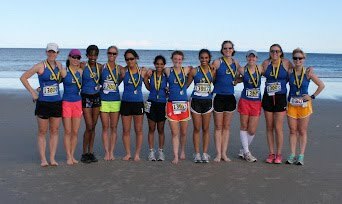 ...but we did place first in the Women's Open of the 2012 NH Reach the Beach.